This peak is #7 on the Height List for Idaho . 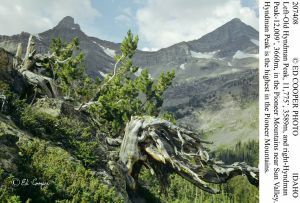 This peak is #4 in Prominence List for Idaho .Hyndman Peak is the highest mountain of the Pioneer mountains in central Idaho. It has a dramatic northeast face that requires stiff mixed climbing to surmount. The normal route is along the southwest slopes, which can be reached from a gravel road along Hyndman Creek to the south of the mountain.